I'm having issues with installing it on my Mac Desktop. I just downloaded the app from your site. Then I get a second window that shows 'Synergy is an application downloaded from the internet.. Are you sure you want to open it? Hi @Jose R. I'm sorry but latest versions of Synergy only supports macOS 10.9.X and newer as show on Operating system support knowledge base article. 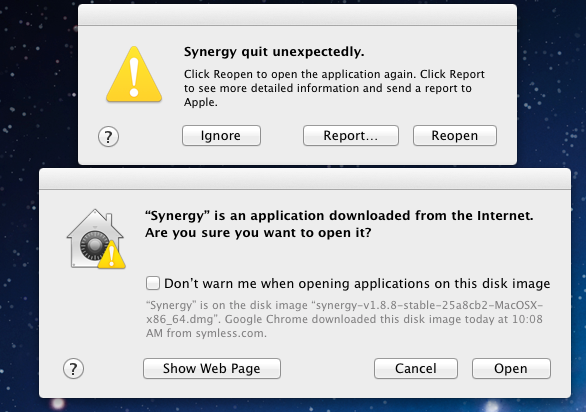 Though you can try downloading Synergy v1.8.5 for macOS instead and try to check if that supports your macOS version. I am having the same problem. I have been trying everything suggested on this forum. No luck. What can I do to get this program to work on my Mac 10.7.5? I have downloaded v.1.8.8 and v.1.8.5 neither work. I know v.1.8.8 is for OSX 10.9 and above. I have v.1.8.5 installed now.